A working-class, Irish-Catholic community on the edge of suburbia, with access to downtown Boston, and a small-town feel that no one wanted to change—this is Arlington, MA in the 1970s. Most families had lived in the town for their entire lives, and connections ran deep. The church parish was strong (“devout, conservative and traditional”) and children growing up knew they were going to play either Little League or hockey. However, as the 1980s approached, a change was going to come in the form of a proposed subway through the heart of the town. The Red Line Extension, which was to extend the Red Line from Harvard Square to Arlington Heights and eventually to Rt. 128 in Bedford, divided the community. It was eventually defeated, but not before laying bare the town for what it really was: a community resistant to change and overwhelmed by the prospect of outsiders dictating—some would say even taking part in—its future. The Red Line Extension plan in its original conception would have essentially consisted of two parts. 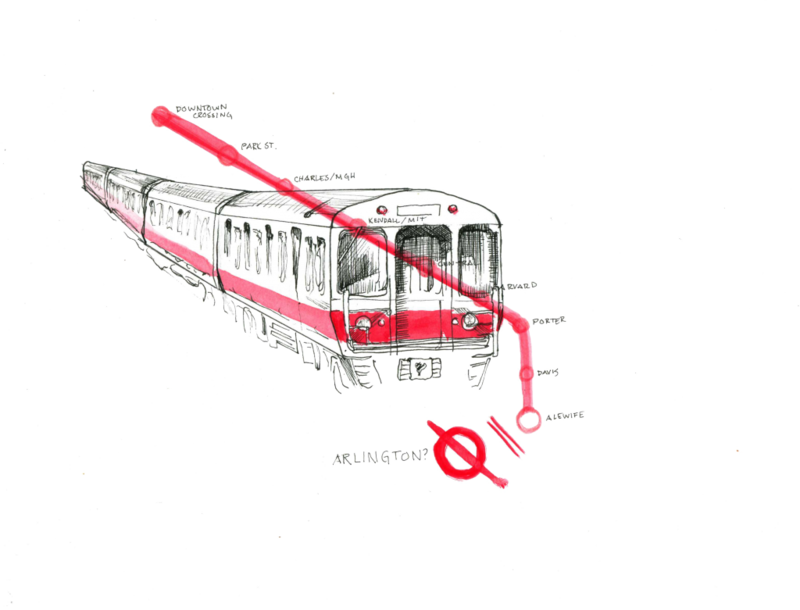 The first part would have extended the subway from Harvard Square to Arlington Center, while the second part would have taken the subway all the way to Rt. 128 in Lexington, where it would connect to a major highway. Though this plan won almost immediate approval in Cambridge and Somerville, the fact that the Red Line would temporarily end in Arlington Center caused an initial round of opposition. The community feared additional traffic, parking, and general congestion that would result from living at the end of a subway line where commuters would park and ride into the city. As a result, in 1972, the Board of Selectmen voted for “128 or nothing”—either the Red Line would extend all the way to Rt. 128 or it would not extend through Arlington at all. Local opposition intensified quickly. The proposed Red Line station in Arlington Center was near Arlington Catholic High School, a division of the local church. Local residents and parishioners saw this location as undesirable. The State Representative, John Cusack, responded by introducing a bill to prohibit the MBTA from constructing any facility within 150 yards of the high school. Though never passed, the bill was supported by 1,000 Arlington residents at a town hall meeting. Out of this legislative effort, the Arlington Red Line Action Movement (ALARM) was born. Largely a creation of the local church, St. Agnes, ALARM placed a special referendum on the ballot in March 1977 on whether or not the Red Line should go through Arlington. The pastor of St. Agnes called a “no” vote, “a must for the survival of Arlington as a residential community.” ALARM and the church worked together to distribute literature, call 18,000 homes, and in the end send the referendum question to overwhelming defeat, with voters rejecting the Red Line Extension 9 to 1. At the end of the day, Arlington had a chance to have a station on the Red Line and rejected it. In the course of less than one year, the town went from being part of the largest federal mass transit project ever proposed in the region, to forever excluding itself from the subway system. The causes were a combination of reasons, both those stated overtly and those left unsaid. Local residents worried that the second half of the extension project would be delayed for decades, leaving Arlington Center as the terminus of the subway line with increased congestion and parking needs. The church—politically influential and “omnipotent” according to a local official—spoke of the need to preserve the fabric of the community. Full disclosure: The author was born and raised in Arlington, and grew up around the corner from St. Agnes Church.